IRVINE, CA--(Marketwire - October 28, 2009) - Orange County-based ZIPZ Shoes™ took first place and won $70,000 in prizes at last week's annual Tech Coast Venture Network's Survivor 5 Competition. ZIPZ Shoes™ is a unique shoe system where the shoe tops and bottoms -- "covers" and "souls" as Zipz calls them -- are interchangeable to create different combinations. The separate pieces are sold in a variety of patterns, styles and colors in toddler, youth and adult sizes. For 25 years, Tech Coast Venture Network (TCVN) has brought entrepreneurs and resources together by providing guidance and advice on pitching potential investors. According to Bart Greenberg, TCVN chairman and a partner at Manatt, Phelps & Phillips, LLP, 52 entrepreneurs seeking equity funding competed TCVN's 5th Annual "Survivor" contest held on October 22, 2009 at Knobbe Martens Olson & Bear LLP in Irvine, California. Before a panel of 15 judges made up primarily of tech investors, each participant was asked to present a 30-second pitch that would attract an investor's attention. Ten companies advanced to the semi-finals where they presented a three-minute pitch and three finalists gave a 10-minute pitch. At the end of the five hour process, ZIPZ Shoes™ was still standing as the sole survivor and best potential investment opportunity as viewed by the panel. ZIPZ CEO John Stefani said, "Everyone at ZIPZ Shoes™ is grateful for this opportunity and support; this win really gives all our hard work some meaning. TCVN put on a first-class event and we're thrilled to have ZIPZ Shoes stand out among all the other great ideas." The $70,000 in first place prizes includes $7,500 in legal work from Manatt, Phelps & Phillips, LLP, $6,000 in IT consulting services from Prelude Systems, Inc., unlimited use of Kyliptix Solutions, Inc.'s web-based software solutions for one year valued at $5,500, $5,000 of acquisition services from eNamix Inc.'s Early Stage/Emerging Technology Practice, $5,000 in patent prosecution services from Knobbe, Martens, Olson & Bear, LLP, a complete search engine optimization and management package from MarketSnag, $5,000 towards a business review by Momentum Venture Management, LLC and various other services. ZIPZ™ Shoes are currently being sold in numerous worldwide retailers and will soon appear in multiple United States retail locations. A limited number of shoes are available for preorder at www.zipzshoes.com. For more information ZIPZ™ Shoes, contact CEO John Stefani at 714.655.6959, john@zipzshoes.com or visit www.zipzshoes.com. 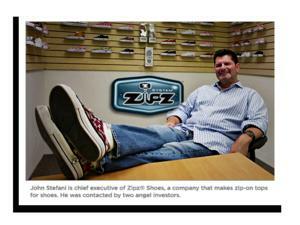 ZIPZ CEO John Stefani is wearing a pair of ZIPZ.